When I was seventeen I did two weeks’ work experience in an East London workshop crafting accessories for architectural models. I was assigned to Trees where I joined a huddle of people hunching over model trees made from mattress foam and spray paint. Amongst them was a Georgian man whose name has sadly escaped memory. He was tall and gentle with John Lennon style spectacles and shoulder-length centre-parted hair. He had a fashion degree and an American accent. When he told me he was from Georgia I assumed he referred to the only Georgia I knew of: the State of Georgia, U.S.A. So when my co-worker began to mention war with Russia and the hardships suffered in Georgia because of it, I was baffled. He was not fooled by my attempts to hide confusion. ‘Georgia is a country next to Russia,’ he explained. I nodded, red creeping up my ignorant face, and saying nothing set back to my dotted springtime trees to avoid what I deemed an awkward conversation. 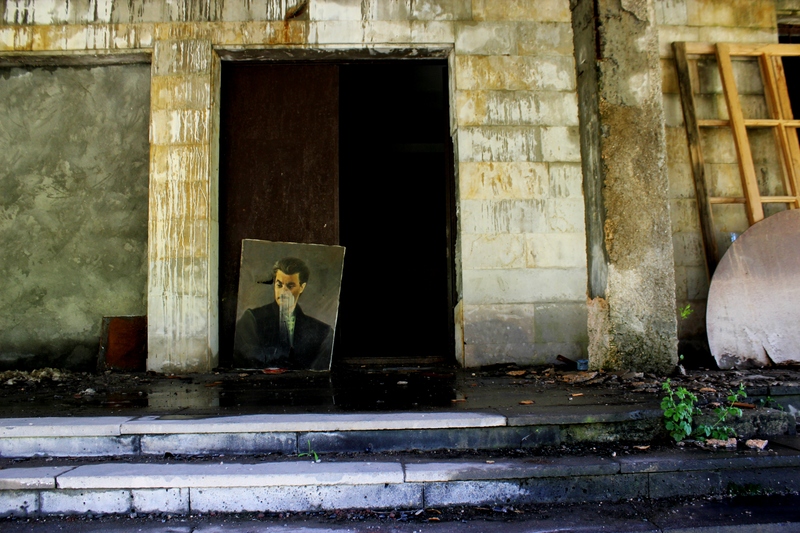 This encounter flooded back to memory as we sped over a lonely road in Georgia’s southern region of Kakheti. We were entering northwards from the unbroken green of the southern steppe and the first signs of changing climate appeared in the form of short sinuous trees lining the road. It must have been the purposeful splay of their branches, or the artful sprinkling of their blossom, or the starkness of their being set against the flat plain that brought back to me the mattress foam trees on the architectural models. I said in passing to my Russian companion, ‘Those trees remind me of some model trees I used to make…’ But I stopped mid sentence because like a pinprick drawing blood from a finger the sight of the trees drew the past from my conscience. The Georgian man with the John Lennon spectacles and fashion degree trickled into my mind’s eye ‘…with the first Georgian I ever met!’ Enthused by this personal revelation, I leaned back in the seat smiling at the satisfying sense of having come full circle. The large Georgian lady with whom I was sharing the back seat asked what all my excitement was about. ‘Ask her in Russian how you say ‘revelation’ in Georgian,’ I commanded. She turned to me, eyes twinkling blue: gamotsxadeba. My gamotsxadeba occurred at the end of a three day hitch-hiking trip from Tbilisi to David Gareja, another of Georgia’s cave monasteries carved into the dry cusp of its Azerbaijan border. 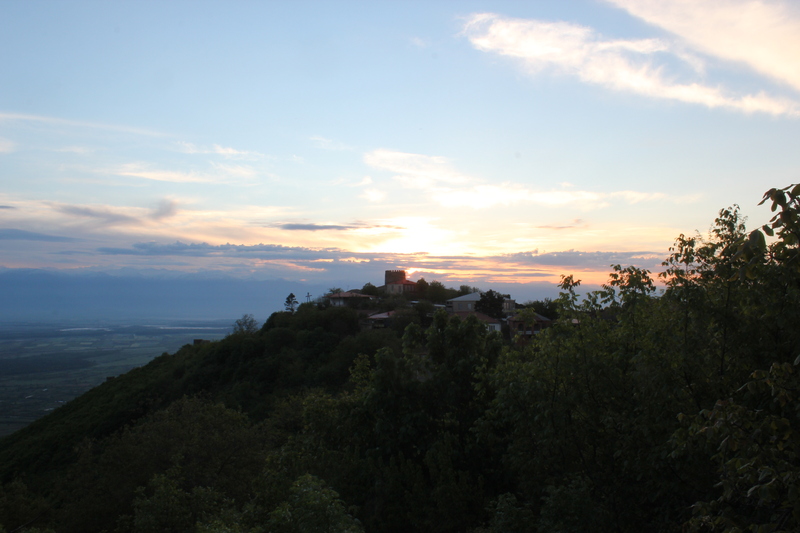 Our trip took us around the region of Kakheti, best known for being the country’s wine region and for its remote, friendly inhabitants. The closest village to David Gareja, Udabno, itself means steppe in Georgian and is testament to the far-reaching hilly plains that traverse the land from here, spreading east into Azerbaijan and dissolving into the Caspian Sea. In the other direction their green undulations ascend and roll ever-greener, ever-higher into the Dagestan Caucasus. 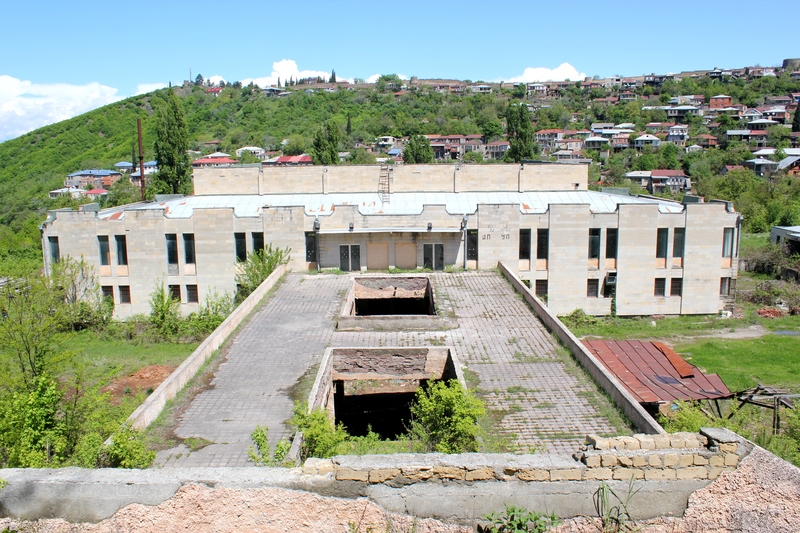 This inner part of Kakheti boasts lush floral landscapes which have given rise to the recent development of the postcard town of Sighnaghi into a tourist hotspot, attracting families of Russian holiday-makers and wine tasting tourists from near and far. 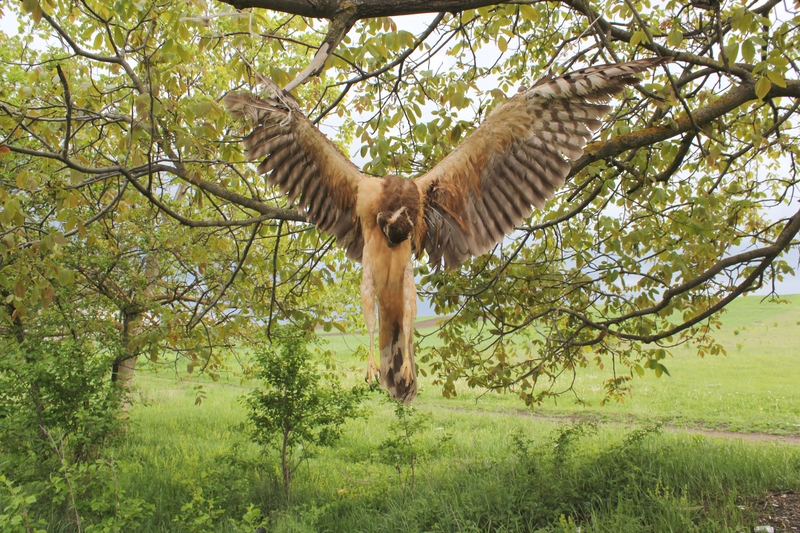 It was to here that our unplanned route out of Tbilisi was dictated by consequence of an eagle strung up to a tree by the roadside: having been dropped off at a crossroad, the strange sight of the bird hanging stiffly by its spread wings with its head bowed in submission to death had drawn us down that particular road. After gazing in wonder and bewilderment at the inexplicable nature of the execution, we lifted our thumbs skyward and waited for a car to carry us away. It was not long before a father and his two sons picked us up in a little van, which was lucky as it was beginning to rain heavily. 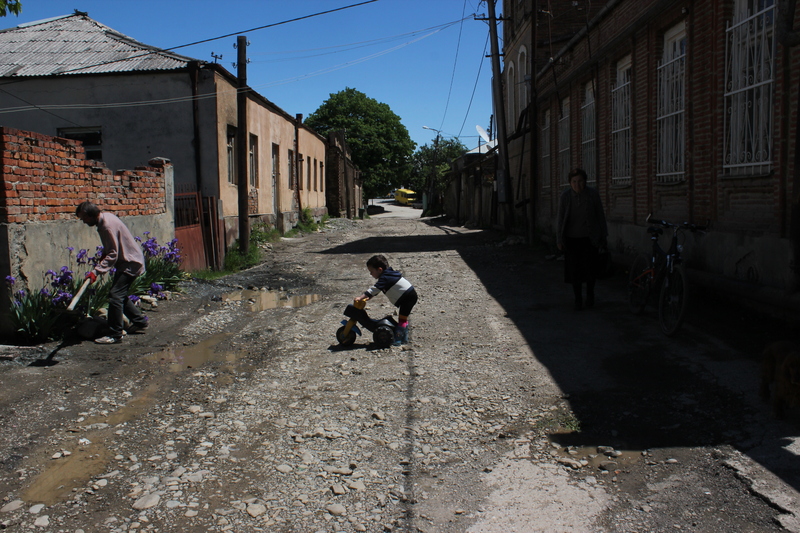 By the time they dropped us in Sighnaghi it had become a torrential downpour. 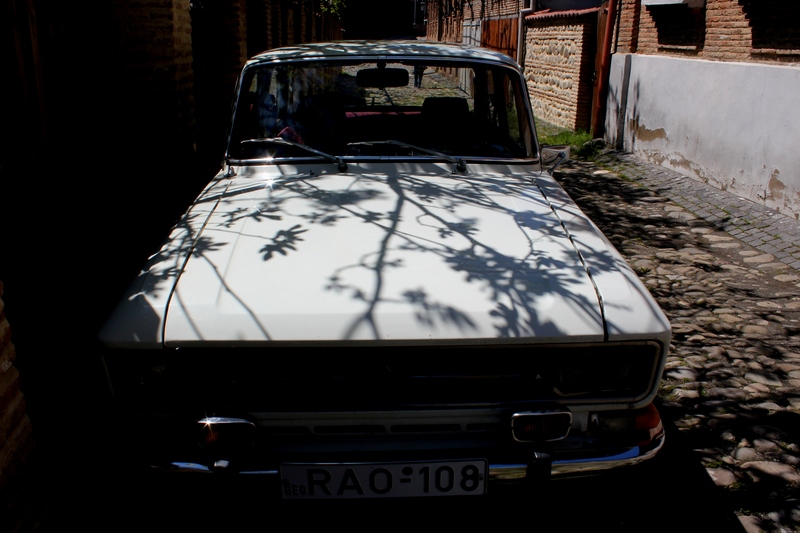 Since we had no idea of where we were going once in Sighnaghi the driver dropped us at the place he thought best appropriate for two hungry tourists – the restaurant Nikala, which he claimed was run by an American named Johnny who would also have rooms for us. Inside was a softly lit well-heeled establishment serving, so they said, the best khinkali in town. We ordered a jug of the fabled wine, but saved the khinkali for another day, ordering instead ostri soups to warm us after the rain. We enquired after Johnny, but in fact the owner was a young Georgian lady who met us with a polite smile and explained that if we were looking for a place to stay, she had a friend with a guesthouse. ‘It is the only place,’ she continued, ‘that washes the bed sheets between customers.’ We took her word for it as we had little other choice and she was offering us a lift. Hence we found ourselves in the Guesthouse Zandarishvili, an eclectic abode offering unlimited wine with the room price (40GEL), a sumptuous breakfast spread for 5GEL and, of course, clean sheets. Inside the building the booklets continued through every dank room, piling high, creeping down the corridors. Only one large, glossy book stood out amongst the array of pastel pink and blue. It was entitled ‘The Fair Elections of Democratic Georgia, 2008.’ I lifted it out the pile and propped it against the wall on a bureaucrat’s desk, considering for a moment taking it with me. But my thoughts were interrupted by an echoing cry, ‘Ali, come see this!’ I made a snap decision that the book had been left there for a reason and turned away, following my friend’s voice towards the back of the building. Cold cavernous corridors led me right and left, before I turned into some double doors and was confronted by a flood of pale light and dust. My eyes adjusting, I made out the outline of my friend in the middle of a basketball court flanked on either side by two torn goalposts; the old gymnasium. 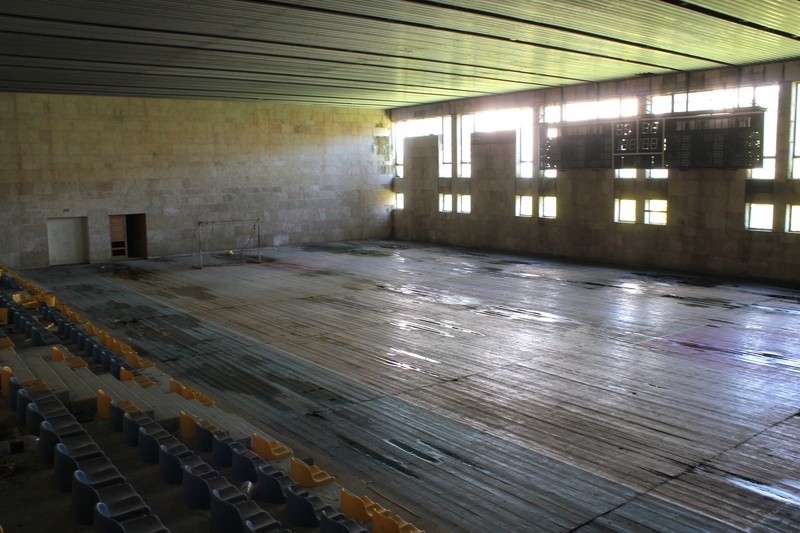 The sea of plastic yellow and blue seats was littered with grey plastic bottles; across the court the digital eights of the 1980s scoreboard were dull and silent. Only the drip-drip of leaking water could be heard on rotting planks. We had found the gem of Sighnaghi and for a moment we felt like two archaeologists who had dug up the ruins of some long-forgotten empire. But time had not yet buried the empire, as we were to rediscover en route from Sighnaghi. Conversations on the road with older generations were a reminder that the USSR protruded through living memory, puncturing the grounds of political unity and tampering with the mechanics of national sentiment. Several ex-servicemen recounted nostalgically their days serving in Moscow then shrugged away the irony as they told us about their sons who now served in the Georgian National Army, training under the overhanging threat of war with the powerful neighbour. 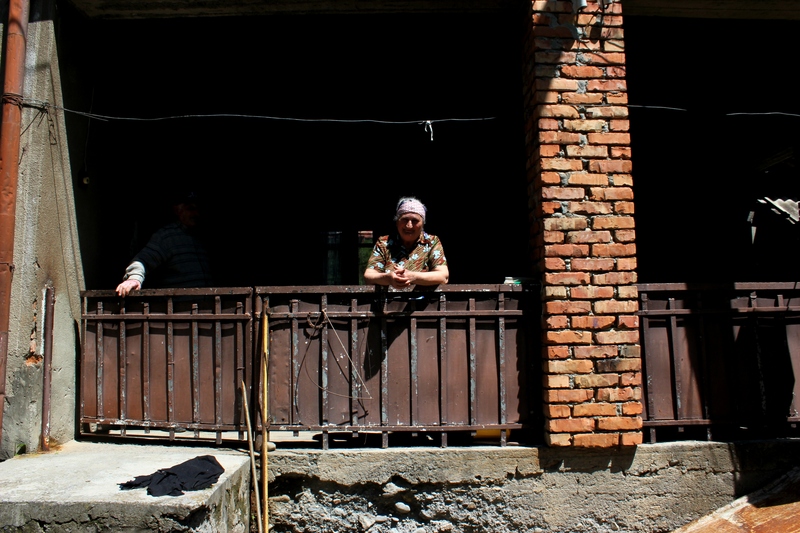 Such was a conversation we had with three old men in Saragejo, the little town lying at the crossroads between Tbilisi, Sighnaghi and Udabno, who bade us join their table in a rundown roadside restaurant. Next to the kitchen an enormous 1980s metal television hummed and flickered with feeble bluish motion pictures showing more of the empire’s unburied remnants: a building in Ukraine was silently going up in flames. The old woman and younger man who ran the establishment looked at us in astonishment as we asked for two cha-chas and a tomato for lunch. The young man filled our glasses to the brim and we were beckoned over by the old men. Several more cha-chas and some photographs later we reeled out of the sad little restaurant feeling distinctly merry and raised up our thumbs optimistically. Cars going this direction were few and far between. Our luck was in. Two cosmopolitan businessmen from Tbilisi were taking a Sunday drive to our desired destination, the David Gareja monastery. Driving onwards the road became noticeably worse and the land drier, the streaky red hills like tattooed knuckles punched into the land. Our driver looked at me laughingly through the rear-view mirror, ‘Ali! Did you drink a lot?’ Yes. ‘You’ll like the monastery.’ The sun was setting as we arrived and we stumbled in the half-light around the archways and caves. I stopped by a group of Tbilisians who were sharing lobiani (bean bread) with one of the monks. I stood to one side of them, swaying a little. The monk was having none of it and motioned me to join them, ‘Come, girl, eat and drink with us.’ I stood grazing on lemonade and the bean bread with the group as the sky turned murky blue ahead of us. They gave me and the monk the remaining slices, kissed his hand, bid me well and roared away to the capital. The monk made a quick blessing motion above my head before taking his own leave, still clutching his lobiani. As for me, I found my friend reunited with his fellow St. Petersburgians who happened to be making the same trip in a hired car. We were lucky for our last lift of the day. They dropped us at the only hostel on the steppe, the Oasis Club, a simple, rug bedecked bar and guesthouse run by Polish expats. We awoke at dawn the next day to the tweeting of birds and the snorting of cows. The dreadlocked French bartender invited me to join him for yoga on the plains to which I obliged – nothing like shaking off a hangover with some spine twisting contortions. By the time we finished, the grey mist had lifted and both the sun and the herds were out in full force. My companion pointed to a fine white cloud on the horizon, ‘I hope that herd is coming our way.’ His hopes were fulfilled. When we left the hostel an hour later, we were face-to-face with a bleating, blade-crunching mass of wool flanked by two tawny young shepherds. They paused to acknowledge us before curiosity got the better of them and they stopped altogether to ask where we were from. The one on horse back, the older of the two, caught me eyeing up the horse. He offered me the reign, ‘Do you want a go?’ I certainly did. I had never herded a flock of sheep before, and my horse-riding experience was negligible, so it was no surprise that both horse and sheep took the opportunity to do their own thing. The mare took up a lackadaisical stroll and the sheep began to scatter outwards. The shepherds did not seem much concerned and continued their job on foot, steering the sheep, the horse and myself onwards towards the mountains for the next hour. I trotted up beside one and ventured a conversation, ‘Who is Inga?’ I asked, nodding to the tattoo on his bicep. He shrugged, ‘The first one.’ We continued on wordlessly until we arrived at the road. I dismounted the reluctant horse and thanked Giorgi the shepherd for his generosity. He shrugged again, but smiled this time. We shook hands and parted, he to the mountain and I to the road where we would be picked up by the yellow car with the large, blue-eyed woman in the back seat. 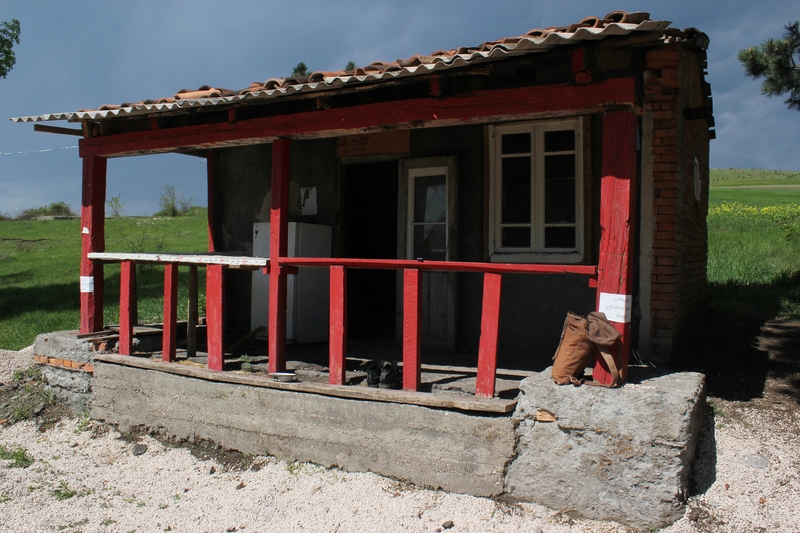 This entry was posted in Georgia, Journal, Kakheti, Travel and tagged Georgia, kakheti, steppe, travelogue. You writing, my Adventuresse, is simply astonishing. I am so proud of your spirit and your curiosity.